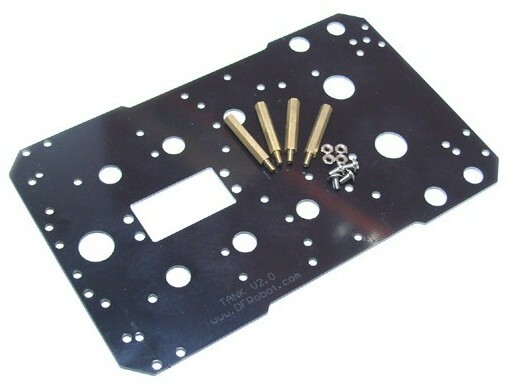 The mounting plate for RP5 tracked chassis is a high strength, non-friable, non-conductive, and designed to fit a variety of sensors, controllers, power switch, charging socket mounting holes, including GP2D12 bracket, infrared switch bracket, Arduino, Romeo, MEGA and other controllers as well as lots of electronic sensors. It also has a servo mounting hole which fit our DF05BB Tilt/Pan Kit (SKU:FIT0045). Get Tank Platform Kit for Arduino (Discontinued) from DFRobot Store or DFRobot Distributor.